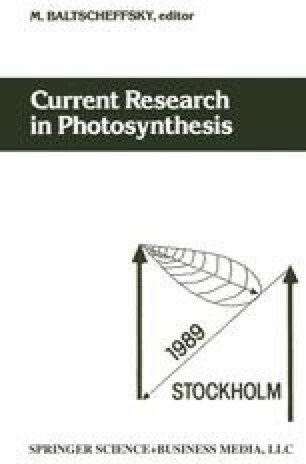 Photoinhibition of higher plants encompasses a range of phenomena, many of which stem from the requirement to harmlessly dissipate excess light energy. These responses to light stress are manifest as a decrease in the quantum yield of photosynthesis and a quenching of chl fluorescence and primarily affect PS II. In intact plants a number of processes have been suggested to protect the photosynthetic apparatus from the potentially harmful effects of excessive light when dissipation through photosynthesis itself is exceeded. These include ΔpH , phosphorylation  and the xanthophyll cycle . When the capacity of these processes is exceeded direct damage to a component or components involved in the photochemistry of PS II takes place [4,5,6].